These once a week individual lessons are an introduction to reading music, learning about melody, rhythm, the beat, and to play by ear. 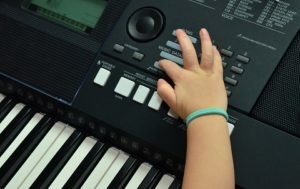 Students will have fun and quickly learn how to play the electric keyboard using both hands with accompanying rhythm and chords. Beginners, and those who have taken music lessons before, are welcome. Students can choose either 30 minute or 1 hour long lessons. Sheet music is included in the class cost.